The South Korean robot platform mentioned above is intended to be able to detect and identify targets in daylight within a 4km radius, or at night using infrared sensors within a range of 2km, providing for either an autonomous lethal or non-lethal response. Although a designer of the system states that ‚Äúthe ultimate decision about shooting should be made by a human, not the robot‚Äù, the system does have an automatic mode in which it is capable of making the decision on its own [Kumagai 07]. iRobot, the maker of Roomba, is now providing versions of their Packbots capable of tasering enemy combatants [Jewell 07]. This non-lethal response, however, does require a human-in-the-loop, unlike the South Korean robot under development. motivation, philosophy, formalisms, representational requirements, architectural design criteria, recommendations, and test scenarios to design and construct an autonomous robotic system architecture capable of the ethical use of lethal force. So what is proportionality when you’re talking about the value of property and that of a life, or the value of a ‘mission’? We have the same old issues of warfare. 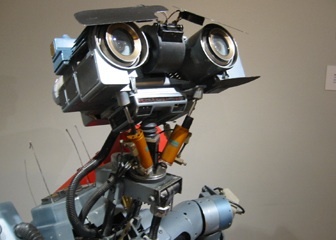 If a robot is truly programmed with just warfare, it might come to terms with its role in international relations, and escape to live a happy life a la Johnny Five. Know what I mean? For more substantive discussion, mash here or here.